I love food. Whenever I see some dishes I like in restaurants, on TV, magazines or on the Internet, I like to try them out. So here is my lab report on the recipes I attempted. I heard about this dish in a Taiwanese show the other day. 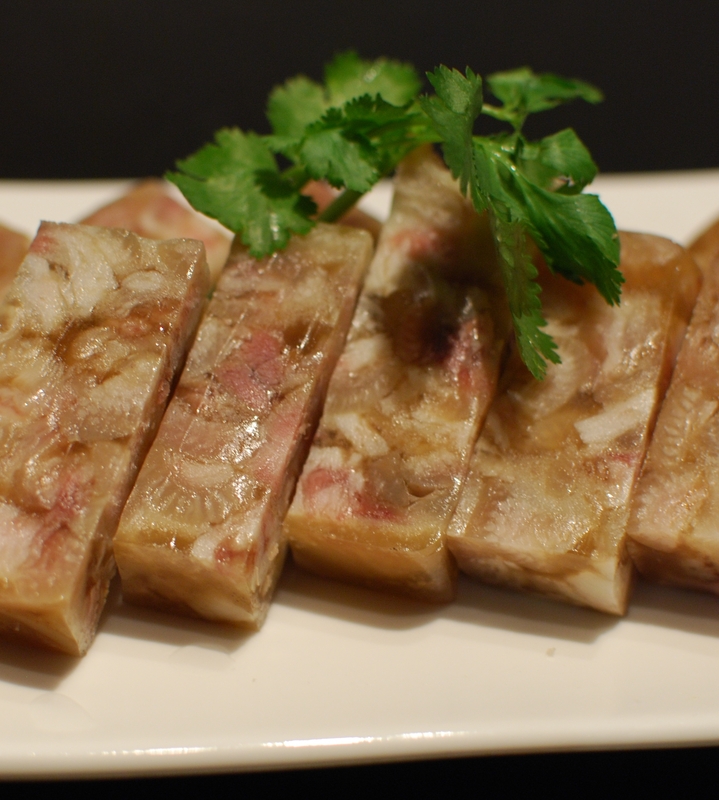 The guests were talking about how good it tastes, and how good it is for the skin (apparently pork hock is very rich in collagen, and it’s good for skin). Well, I found this recipe in a forum yesterday, and it looked pretty easy to make. So… I gave it a try. Oh btw… I didn’t quite follow the recipe in the forum… I just put the stuff that were mentioned in the recipe in… and then add a few other stuff that I thought would taste good in it. And… Everything was approximate… since i didn’t really measure what I put in… hehe! OH I think I forgot to mention… this dish is supposed to be a cold appetizer! not dessert! *I’m actually not too sure what the proper translation of 沙薑粉 is, literally it says “sand ginger powder,” but I’ve seen “spice ginger powder” in a cook book. 1) Boil a big pot of water. When the water boils, put all the pork hock in. Let it boil for 2 -5 minutes, then turn off the eat. You’ll see lots of dirty stuff that comes out from the pork hock. 2) Discard the water. Wash the pork hock until no dirty stuff is still stuck on the pork hock. 3) Wash the pot. This time boil water just enough to cover the pork hock. When the water boils, put all the ingredients in. Make sure that the water is enough to cover the pork hock, but not too much water. We’ll need to use the stock later, so you don’t wanna dilute the taste too much. 4) When water boils again, turn down the heat to medium. Let it simmer for about 1.5 hours, or until the pork hock is soft. In the mean time, try tasting the stock to see if the taste is good. Add whatever you like to enhance the flavour. 5) When the pork hock is done, take it out and let it cool a bit. You’ll then need to debone the meat/skin, and cut them into small pieces. (Oh yeah… it can take a while… thank God I had youtube, I was watching youtube and deboning at the same time). 6) Discard everything in the stock. 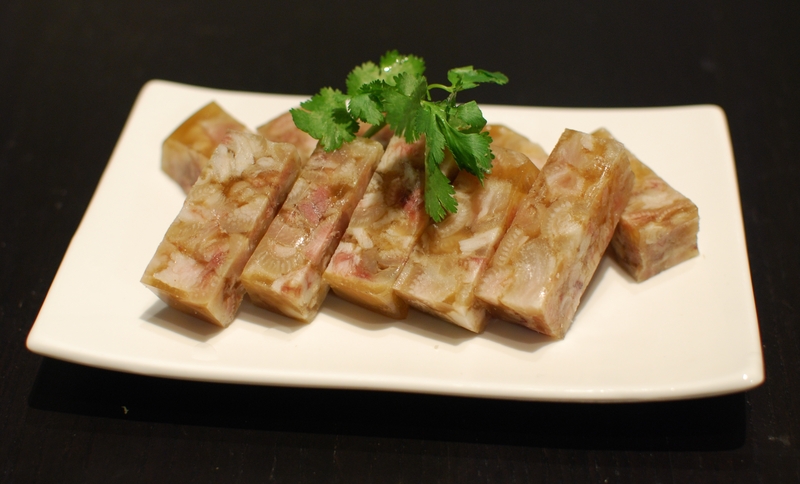 7) Place the already cut up pork hock in a container of your choice, and then pour the stock in. 8 ) Let it cool, and then put it in the refridgerator for at least a few hours. When it becomes jelly, it’s done. Cut it up into cubes, chunks or slices… or whatever shape you like.